Metros are the most convenient way to travel to different places cheaply in Mumbai. However, how good it will be if you can save even more bucks on those low fares of Metros. Well it is now possible with Nearbuy as it is offering Mumbai Metro Pass at upto 50% off. Not only this, you can also avail extra 1% off on paying via PayUmoney wallet. So, buy now and enjoy your hassle-free traveling !! 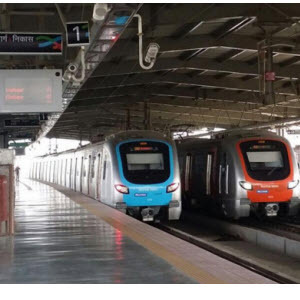 Nearbuy offering Mumbai Metro passes 50% off + extra 50% off (New users) + 1% off using PayUMoney. Reliance Mumbai Metro’s Versova-Andheri-Ghatkopar corridor offers its passengers the highest levels of comfort while on the move. Extending from Versova to Ghatkopar, the 11.4km long route runs on a dedicated elevated corridor, featuring fully air-conditioned world-class coaches and highest levels of passenger security systems. The twelve stations en route provide ease of access with lifts, escalators and a modern, automatic fare collection system. For Offer 3 & 4 : Long Distance Metro 45 Trip pass: Long Distance pass covers all the 12 stations for 30 days period. Reliance Mumbai Metro’s Versova-Andheri-Ghatkopar corridor offers its passengers the highest levels of comfort while on the move. Extending from Versova to Ghatkopar, the 11.4km long route runs on a dedicated elevated corridor, featuring fully air-conditioned world-class coaches and highest levels of passenger security systems. The twelve stations en route provide ease of access with lifts, escalators and a modern, automatic fare collection system.